The recently concluded Consumer electronic technology conference CES in Las Vegas witnessed the much awaited announcement of Netflix’s expansion into India and over 100 different countries around the world including UAE, Pakistan and Russia. “Right now, you are witnessing the birth of a global TV network” – Reed Hastings, the Chief Executive of Netflix announced from the stage in his keynote address ending months of speculation about its entry to India, one of the fastest growing digital markets in the world. Since we; at Vidooly deal with YouTube content creators everyday, our interest piqued as soon as we heard this news. The big question on my mind was – are we ready for paid/on-demand content consumption? 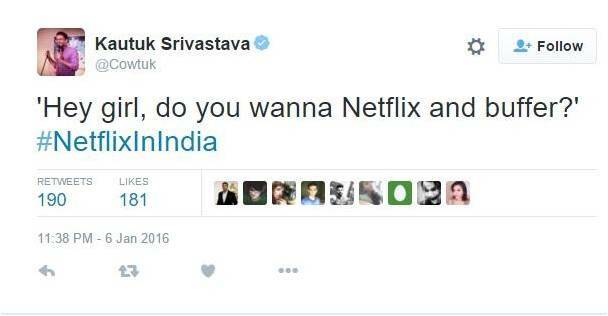 More like Netflix and Buffer, a stand-up comic had commented on Twitter taking a jibe at the relatively slower internet bandwidth that we get here in India, compared to the US. Well, he has a point doesn’t he? According to conservative estimates, internet users in India consumed an average of 765 MB of data a month as of September 2015. And majority of it is used for streaming music and video. Netflix says that its subscribers would need a minimum of 3MBPS connection to stream content seamlessly in SD and 5MBPS in HD. And streaming content continuously for an hour would use up about 1 GB data which is more than the average monthly usage of Indian internet users! A recent Nielsen survey claimed that 9 out of 10 Indians believe that free content on the internet should remain free in the future. However three out of said they're willing to pay for the content if the quality is significantly better than what is currently free online. The Indian OTT (Over the top content) ecosystem is still in its infancy but the future is looking bright given the rate at which internet penetration is increasing in the country. The largest local player in the arena, media giant Star India’s Hotstar has over 35 million downloads in Google playstore. Besides hosting original shows, it also hosts popular TV programs and movies on its platform. Popular comedy group AIB runs a show called “On Air with AIB” which is already a hit amongst the tech-savvy crowd, which forms a huge chunk of the 35+ million subscribers of the service. Spuul, ErosNow, Bigflix and Box TV are some of the other hot players in the circuit. Is Netflix the answer to our censorship troubles? The Censor Board of India has quite a history. Set up by British rulers in the 1920s to block US movies with anti-colonial sentiment, the board has a lot of say on the movies and TV shows even today! Popular sentiment about the content gatekeeper has deteriorated over the past few months; especially after the James Bond censorship debate. And that’s why; uncensored programming is one of the important pulls of Netflix. Netflix is a global giant. It already has a solid presence in the US and despite just running at a break-even profitability, has a lot of money in the bank to play with. It is aiming to spend more than $6 Billion in cash on original content programming; with plans to release 31 new and returning original series’, 24 films and documentaries and 30 original children series and stand-up comedy specials! An average India now spends more time on his smartphone (3 hours and 18 minutes) than on TV (2 hours and 8 minutes), everyday! India already has around 35 crore internet connections (Almost the entire population of US!) which is set to grow more in 2016. Netflix is quite pricey compared to its Indian counterparts. The plans start at 500 Rs which might be a turn off for most Indians. Number of Connected TVs or smart TVs in India is set to grow exponentially in 2016. Strategy Analytics forecast that India and China will account for 42% of all connected TV sales worldwide in 2016! This will definitely result in an increase in the number of consumers viewing full-length movies and TV shows on internet daily. Eros Now charges INR 49/99 per month, Box TV charges INR 199 per month, Hungama’s pricing starts at INR 249 and Spuul charges INR 300 per month. Online music streaming platforms like Saavn and Gaana have taken the freemium route - One can get ad-free content in exchange for a monthly subscription. The Indian consumer segment is all set to enjoy a wide variety of video content. Netflix’s entry has ruffled the setup a bit, but it’s a good thing. We’ll now see a healthy competition between all the players and witness an increase in quality original content online. TVF started to host its content on its own personal platform, there are newer YouTubers emerging regularly and original shows without censorship are already on the air. All in all – 2016 is going to be a fantastic year I’d say!